By Capt. Larry G. DeVries, CEC, USNR, Ret. The events that led to the participation of the Seabees in the battle for Guadalcanal in World War II started with the actions taken by Rear Admiral Ben Moreell, Chief of Civil Engineers, and the staff of the Bureau of Yards and Docks (BUDOCKS) in the early weeks of the war. Captain John N. Laycock, Civil Engineer Corps, was in charge of the planning for Seabee units and expanded on the early work of Commander Walter H. Allen at the Great Lakes Naval Base who had pioneered the concept of construction units composed of naval personnel. When the war began, Rear Admiral Moreell expanded and acted on the planning that had taken place and began to organize several units of Civil Engineer Corps officers and skilled petty officers. On 5 January 1942, Rear Admiral Moreell's superiors directed him to begin recruiting the men that were to form the Navy's new construction battalions. Seabee enlisted men were recruited with skills needed in the battalions and came primarily from the construction industry. Civil Engineer Corps officers, many with prior military and construction experience, were commissioned to serve in the units. Construction of facilities in the south Pacific had been recognized as a high priority requirement for a number of years based on War Plan Orange (later Plan Rainbow Five) and related contingency planning efforts. A more intense phase of construction using civilian contractors started in July 1939 in the Hawaiian islands by BUDOCKS and that contract, and subsequent contracts, resulted in work at Midway, Wake, Johnston Island, Palmyra Island, American Samoa, Guam and Cavite in the Phillipines. A significant amount of construction took place resulting in the initial construction of naval bases, naval air bases, communication stations and fueling stations. After the Japanese attack civilian workers and Civil Engineer Corps officers, who were supervising the work, were subject to capture and imprisonment or death as was the case at Wake, Guam and the Phillipines. Naval Construction Battalions were organized around the allowance of 33 officers and 1,081 enlisted personnel. They were organized in five companies including a headquarters company and four construction companies. The organizational allowance was designed to provide a self-sustaining unit with individual and organizational equipment, vehicles, supplies and material to perform construction work. The original planning resulted in battalions being assigned as a functional component part of advanced bases known as CUBS, ACORNS and LIONS which were the code names for standard advanced naval bases. Naval Construction Battalions were "completely equipped and self-sustaining able to construct airfields, roads, bridges and buildings at an advanced base and to install, operate and maintain its public utilities." The first naval construction unit to deploy from the United States was designated the First Construction Detachment. The unit left Quonset Point (Newport), Rhode Island, on 17 January 1942. It stopped at Norfolk, Virginia, and Charleston, South Carolina, and on 27 January left for Bora Bora in the Societies Islands with the mission of constructing a fueling station and other facilities. The 296 men of the unit arrived on 17 February 1942. This unit took on the name of Bobcat Detachment as Bobcat was the code name for Bora Bora. On 5 March, Construction Battalion personnel were officially named Seabees by the Navy Department and the fighting, building bee insignia and shoulder patch was approved. The initial NCB to be organized was the 1st NCB which was commissioned at Camp Allen, Virginia, near Norfolk, in March 1942. Deployment resulted in companies being sent to Tonga Tabu and Efate, New Herbides, in April 1942. The 2nd NCB arrived in the southwest Pacific in April and May of 1942. The 3rd, 4th and 5th NCBs arrived in the Pacific in June 1942. The 6th NCB, which was destined to be the first naval construction battalion to come under enemy fire, was activated at Camp Allen, Virginia, on 24 June 1942, and went from Gulfport, Mississippi, to Moffett Field, California, and on to San Francisco. It left for the south Pacific on 21 July on the USS President Polk and the USS Wharton with five other ships escorted by the light cruiser USS Helena (CL-50). The 6th NCB reached Esprito Santo on 11 August via Pago Pago, Samoa. The landings of the 1st Marine Division (Reinforced) occurred on 7-9 August 1942 at Guadalcanal (code name Cactus) and Tulagi as Operation WATCHTOWER. The Marine's 1st Engineer Battalion took on the majority of the work at the partially completed Japanese air strip named Henderson Field by Major General Alexander A. Vandegrift, USMC. Work at the field allowed a PBY (Lieutenant W. S. Sampson, USN) to land on 12 August. On 16 August the first element of CUB-1, an advance fuel and supply base, landed. This element, under Ensign George S. Polk, USN, consisted of five officers and 118 enlisted personnel, all navy petty officers of aviation support ratings. On 20 August Lieutenant Commander Joseph P. Blundon, CEC, USNR, who was Officer-in-Charge of the 6th NCB, arrived in a PBY which landed off Lunga Point. He immediately called on General Vandegrift and his planning was directed at work on Henderson Field. Lieutenant Commander Blundon requested two companies from his NCB at Esprito Santo be sent forward with a few extra men trained for special details such as water purification and machinery repair. Early in the week of August 24th, directions were received from Commander, South Pacific Amphibious Force (Task Force 62, Rear Admiral R. K. Turner, USN) to transfer four hundred personnel to Cactus, two hundred each on the transport USS Fuller (AP-14) and the cargo ship USS Betelgeuse (AK-28). Companies A and D were designated and boarded the USS Betelgeuse on Saturday. This first contingent landed on 1 September 1942 and consisted on 357 men and five officers under Lieutenant (Junior Grade) Thomas L. Stamp, CEC, USNR. Lieutenant Commander Blundon had departed by aircraft to Esprito Santo on 27 August and returned on 29 August with Commander James P. Compton, USN, who was Commanding Officer of CUB-1. Lack of transportation shipping, enemy action and the need for other priority unit and supply shipments caused the 6th NCB to arrive in elements. The second element of 156 men from the 6th NCB departed Esprito Santo on 29 August and arrived on Guadalcanal on 26 September. The third, fourth and fifth elements arrived on 2, 9 and 12 October resulting in 1,002 men, including 17 officers, on Guadalcanal-Tulagi by mid-October. The flooded camp of the 14th Seabees, located at Koli Point, Guadalcanal. The main body force consisted of approximately 1700 personnel. The second section of the 14th NCB arrived in two elements on 29 November and 23 December. In addition, other NCBs arrived on Guadalcanal and Tulagi during the battle period of 7 August 1942 to 9 February 1943. The 18th NCB was formed at Camp Allen on 11 August and transferred to Davisville, R. I. On 6 September, C Company was transferred to the C. B. Replacement Group, Fleet Marine Force, San Diego, California. The remainder of the battalion was transferred to the FMF Base Depot, Norfolk, and embarked on 11 September 1942 as part of the Second Marine Division arriving at Noumea, New Caledonia, on 11 November. B Company landed on Guadalcanal on 6 December with A, D and Headquarters companies arriving on 12 December. More 18th NCB elements arrived on December 19 and 25. The construction work was centered around Henderson Field and the Naval Operating Base at Lunga and at Koli Point on Guadalcanal. On Tulagi the construction effort was focused on Tulagi Harbor and the motor torpedo boat base supporting Motor Torpedo Boat Squadrons 2 and 3 as well as the seaplane base on Halavo peninsula on Florida Island. Pier construction by the 26th Seabees at Lunga Point, Guadalcanal. At Lunga the extension and improvement of Henderson Field absorbed the majority of the effort, especially for the first elements of the 6th NCB. Two additional airfields, Fighter 1 and Fighter 2, were also constructed there. At times the 6th NCB had 25-30 construction projects underway. At Koli Point the 14th NCB began construction of two bomber airfields called Bomber 1 and Bomber 2 at Carney Field. This work began after the unit arrived there on 3 December because construction conditions were determined to be unacceptable at Aola. 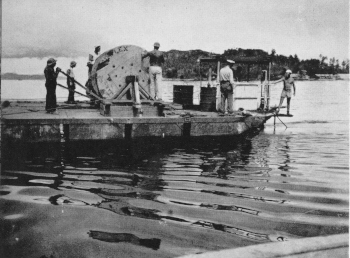 Other Guadalcanal work, in addition to unit encampments, was road construction, bridge construction, gravel and coral pit operations, Navy and Army docks, a Marine railway, boat pool anchors, gun emplacements, railways, fuel systems, pipelines and booster stations, gasoline bulk plant operations, tunnels, buildings of all sizes and types, sawmills and logging operations, an ice plant, power generation and power distribution and radio stations. In addition, stevedoring work and salvage work on ships used Seabee labor. Cable laying in Tulagi Harbor by the 26th Seabees. A detachment of the 6th NCB under Lieutenant Ben Marcus, CEC, USNR, was sent to Tulagi on 9 October. On Tulagi the work included power generation and distribution lines, telephone and communication lines, water systems, fire systems, gun emplacements, sawmills, piers, gasoline and avgas storage tanks, a radio station and general construction for units assigned there. The harbor there was very important and at various times the heavy cruisers USS Pensacola, USS New Orleans, and USS Minneapolis, the PT tender USS Jamestown, and the destroyer-seaplane tender USS McFarland were disabled and were worked on in the harbor. Construction work took place also on Gavutu, Tanambogo and Halavo. The 26th NCB was formed at Camp Allen on 18 September 1942 and arrived as a unit on Guadalcanal on 26 December 1942. Their mission was to relieve the 6th NCB. The 26th NCB reported to CAPT Thomas M. Shock, USN, who had been assigned as Commander, Naval Bases Solomons, on 12 December and was the senior officer for the developing bases on Guadalcanal-Tulagi. The 27th NCB was formed at Camp Allen on 23 October 1942 and arrived on 3 January 1943 as a unit on Tulagi to continue work there started by a detachment of the 6th NCB. By December resupply landings to the islands were occurring every day and this allowed full units with their supplies to land. Major General Alexander M. Patch, US Army, relieved Major General Vandegrift on 7 December 1942, and established the US XIV Corps on Guadalcanal. By the first week of January 1943 the American forces on Guadalcanal and Tulagi numbered about 50,000. Five Naval Construction Battalions, consisting of over 5,000 officers and men, had contributed to the effort at that time although unit strength after arrival was quickly depleted primarily due to malaria and other diseases. The 6th NCB was the first unit to depart on 5 January 1943. The 6th NCB was the first unit to suffer fatalities due to enemy action (Chief Machinist Mate Henry L. Thompson, killed in action October 14, 1942) and the first unit to have members decorated for action under enemy fire. It was one of four NCBs to earn the Presidential Unit Citation during the war. Units on Guadalcanal generally spent one year on the islands before they were sent to various bases both in the south Pacific and in the United States for rest, replacements and re-outfitting. The XIV Corps planned and conducted an offensive that lasted from 10 to 23 January 1943. During the nights of early February the Japanese evacuated their remaining men and on 9 February 1943 General Patch declared the island secure. Seabees construct one of the many bridges on Guadalcanal. A total of seventeen construction battalions, including five Construction Battalion Special (Stevedoring) battalions, were assigned to Guadalcanal. During 1943 the 34th, 46th, 53rd, 61st and 63rd NCBs arrived (after the end of the battle period on 9 February). The first Special arrived in March and the 4th and 9th Specials arrived later. Construction Battalion Maintenance Unit 501 took over part of the base maintenance duties on Guadalcanal in March 1943 and CBMUs 532, 533, 518 and 520 served later. The 18th, 25th and 58th Battalions staged through Guadalcanal with Marine Divisions and numerous Seabee groups were at Guadalcanal prior to forward movements to the upper Solomons. The Guadalcanal Campaign provided the proving ground for Naval Construction Battalions and their need for the campaigns to follow in the Pacific. At its peak over 258,000 Seabees and CEC officers were on duty in World War II. Eventually, 150 Naval Construction Battalions and 41 Construction Battalion Specials were established and served around the world on all continents. One hundred thirty-five CBMUs were formed. One hundred eighteen Construction Detachments and five Pontoon Assembly Detachments were also formed. Other services, and the rest of the Navy itself, were lost on the distinction among the unit types. They all became known as Seabees. Story Copyright ? 1992 Larry G. DeVries.